Certificates of completion are printed and mailed each hour of the day (up to 6:00 PM). This means that if you finish the course at 5:59 PM and selected the overnight delivery method, you will receive your certificate of completion the very next business day. I have to take a Texas defensive driving online course. What is the cost of this program? The prices may vary by format for GetDefensive.com’s Texas internet defensive driving courses and internet auto insurance reduction courses. The price may be slightly more if you select the defensive driving DVD or the defensive driving streaming video. For the internet defensive driving course, the cost is the minimum allowed price under State law, and this includes the mailing of the Texas completion certificate that will be sent via regular US mail. I prefer to complete the GetDefensive.com defensive driving online defensive driving class in the next week. Can you let me know what is the process following registration? Basically, there are two (2) types of online defensive driving classes that are available. One is for ticket dismissal and the other is for auto insurance premium reduction. You can finish the online defensive driving class on any computer with online access, and you are permitted to start and stop as often as you'd prefer, and pick up from wherever you left off. The online defensive driving class is divided into several chapters, and at the end of each chapter you will need to take a short, multiple-choice quiz which will assist you in preparing for the final exam. Once you pass the final exam, GetDefensive.com will give you a completion certificate which will be sent to you via the mailing method that you pick at the time of registration. How can I confirm if I can obtain an auto insurance premium reduction if I register for GetDefensive.com’s defensive driving internet course? Although we do urge that you consult with your local auto insurance agent before signing up for the GetDefensive.com online defensive driving course. We can tell you that many auto insurance carriers offer discounts of up to 10% to policyholders who successfully complete the GetDefensive.com internet defensive driving course. Also, customers who do complete our internet defensive driving course for ticket dismissal get two (2) copies of his or her certificate of completion--one to give to the court and one to submit to his or her auto insurance agent. I have a busy schedule, and may need to complete the GetDefensive.com Texas defensive driving internet course from two different computers. Is this permitted? Absolutely! You can complete the GetDefensive.com defensive driving online class from multiple computers if you have to, but you will need to besure that each computer is equipped with the flash and browser requirements that are necessary. GetDefensive.com will run a quick scan on any computer that you log into for the initial time to make sure that it has the required software installed. I am a busy student and have many distractions during the day. May I start and stop the GetDefensive.com Texas defensive driving internet course as often as needed? Yes, you may start and stop as needed when you take GetDefensive.com’s defensive driving internet class. You are not required to take the course all at once. When you do need to take a break, you can then resume where you left off. GetDefensive.com’s program is flexible, and it can be arranged around any busy schedule! Do I have to give a copy of the Texas certificate of completion to the court after I successfully pass website?’s defensive driving internet class? Yes. 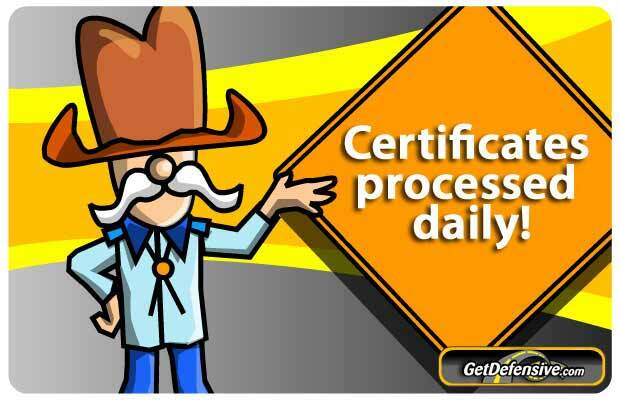 When you successfully finish the GetDefensive.com Texas online defensive driving class, the completion certificate will be mailed to the shipping address that you entered when you signed up. Please remember that you will have to present it to the court by or before the court due date. I am upset that I now have two (2) traffic citations this year. If I sign up for the GetDefensive.com Texas defensive driving online class, how can I know for certain whether it is court approved? GetDefensive.com is 100% recognized by every court in the State of Texas for online ticket dismissal. If your traffic ticket is eligible for dismissal, your court will inform you as to when you have to complete a defensive driving class. You may also qualify for a 10% auto insurance discount through your insurance carrier if you successfully complete the online defensive driving class at GetDefensive.com; however, we advise that you first call your local auto insurance agent. I would want to keep my recent traffic citation off of my Texas driver record. What are the eligibility requirements for signing up for GetDefensive.com’s defensive driving online course? State Law in Texas prohibits you from removing more than one (1) traffic citation every twelve (12) months. If you are not certain when you last successfully completed the internet defensive driving class, we advise that you consult with the traffic court to confirm if you currently are eligible to take GetDefensive.com's defensive driving online class. How can I still satisfactorily complete the GetDefensive.com Texas defensive driving internet course if I incorrectly answer a lot of the quiz questions? It is still feasible. The quizzes are essential and assist in preparing you for GetDefensive.com’s defensive driving internet class final exam, but they will not go against your overall class grade. If I finish the GetDefensive.com Texas online defensive driving course, is it equivalent to completing a defensive driving program in an actual classroom setting, and how can I be sure if my local court accepts it? GetDefensive.com’s online defensive driving course is certified by the State of Texas as an equivalent to the traditional defensive driving classroom course. Also, when you take GetDefensive.com's internet defensive driving class, you do not have to allow extra time to attend and sit through any lengthy classroom instruction. The GetDefensive.com program is convenient for an active lifestyle, and you can set your own schedule!